I’m not a big fan of food being pretty for the sake of it and god knows the internet is full of recipes that are style over substance. Flavour and texture are much more my bag, but a funny thing happens, often when you’re layering up great flavours and textures in a dish, the prettiness appears. This crispy skin salmon, kale, avocado and butternut salad is one of those recipes. It is hearty enough for dinner and leftovers make the most delicious insta-friendly packed lunch. This substantial salad is packed with ingredients that are amazing for your skin and overall heath. I’m giving you two flavour options for the dressing, so once you get the technique down you have another meal ready to go. 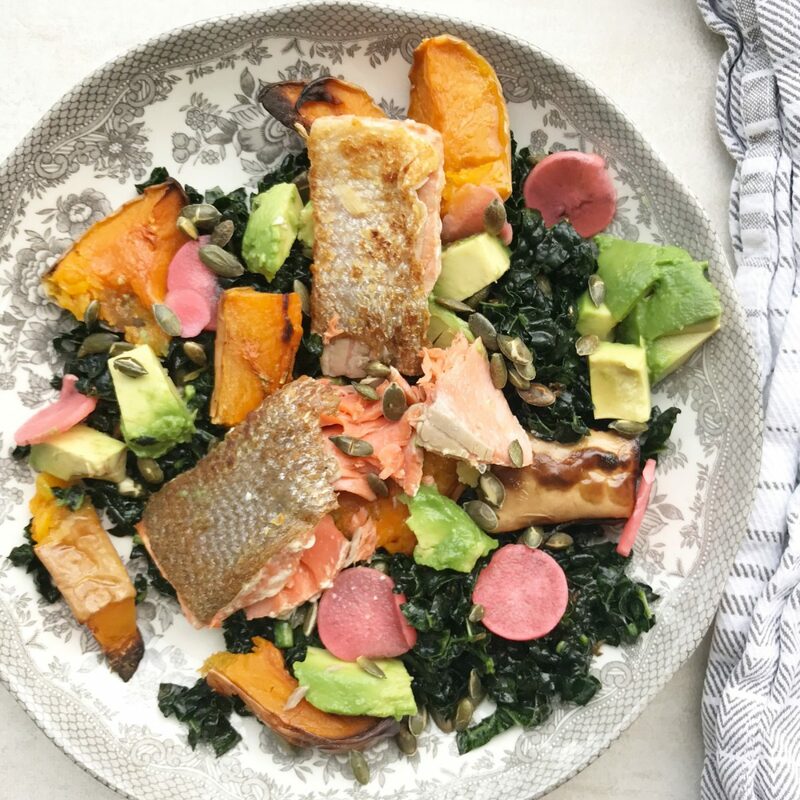 Does this crispy skin salmon, kale, avocado and butternut salad fall into the one meal for the whole family theme I try to live by? Maybe not. My boys aren’t wild about raw kale (understatement) but they love salmon, butternut squash and avocado so I just give them those bits with a squeeze of lemon and either some leftover brown rice from the freezer, quickly cooked soba noodles or a toasted flatbread. By massaging raw kale rather than cooking it, you will make it softer, easier to digest and faster to chew. Kale is packed with Vitamin C. Adding an acid-heavy dressing cancels out any bitter flavour, so always dress it with a lemon, lime or vinegar-heavy dressing. Toasting zinc-packed, pumpkin seeds not only wakens up their nutty flavour, it makes them pop like popcorn. The popped seeds can sit in a jar for a few days so it is worth doing a handful at a time. I love them with yoghurt and berries for breakfast. Butternut is a great source of vitamin A (aka beta-carotene). It needs to be combined with fat to be absorbed so combining it with the avocado and salmon is perfect. I roast a batch of butternut squash once a week and keep it in the fridge ready to add bulk and sweetness to salads, soups and curries during the week. 2 handfuls roasted butternut squash cubes Watch my how to prep and roast butternut video here. Optional – sliced pickled radish or pickled ginger. Find my speedy radish pickle recipe here. Make the popped pumpkin seeds…Put pumpkin seeds in a non stick frying pan, without oil, on a medium high heat. Shake them every minute until they start popping and splitting. Cooking and shake until they smell nutty. Take off the heat and set aside. Fry the salmon…Heat the same pan you used for the popped pumpkin seeds until it is smoking hot. Dry the salmon fillets on kitchen paper, this will stop them sticking to the pan. Rub the fillets all over with a little rapeseed oil and sea salt and put them into the pan skin side down. Drop the heat to medium high and leave without moving until the side of the salmon is opaque two thirds of the way up, this usually takes 3-4 minutes, before carefully sliding a fish slice under the salmon skin and flipping it. Turn the pan off and leave for a minute before lifting the salmon onto a plate. If you like your salmon well done, leave it on a low heat for a couple more minutes. While the salmon cooks make the massaged kale…Gather the washed kale by the stalk end. Finely shred the kale by chopping from the leaf end towards the stalk. As you get to the thick stalk end, rip the leafy bits and discard the stalk. Put the chopped kale in a large bowl and add a pinch of salt. Use your hands to squeeze the kale for about a minute until it reduces in volume by half and gives off green liquid. Finely chop the basil leaves and stalks and add them to the kale. Set aside. Dress the kale and basil with either the lemon or Thai dressing. Lemon – use a fine Microplane to zest both the lemons onto the kale. Cut the lemons in half and squeeze one full lemon into the kale. Add the oil and pepper and toss. Taste and add more salt, pepper and more lemon juice as needed. Thai – use a fine Microplane to zest the limes straight onto the kale. Cut the limes in half and squeeze both into the kale. Add the chili and fish sauce and toss. Taste and add more fish sauce (for salt), chili (for heat) and more lime juice (for acid) as needed. To serve your crispy skin salmon, kale, avocado and butternut salad, scoop your dressed kale onto a plate. Lay the salmon on top and then scatter the pumpkin seeds, roasted squash and avocado over. Squeeze a final hit of lemon or lime over the salmon before eating. Serve warm or at room temperature. Find more recipes for salads, salmon, avocado and kale here.